Spoor - ZineWiki - the history and culture of zines, independent media and the small press. 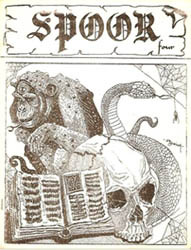 Spoor was a literary zine devoted to horror and weird fiction published by Fred C. Adams. The first issue of Spoor appeared in 1974, and was published in Pennsylvania, U.S.A. It featured an extensive directory of fanzines devoted to horror fiction, and the story "Wander" by Jessica Amanda Salmonson (The Literary Magazine of Fantasy and Terror). Issue two featured additions to the directory, as well as an interview with Dale Donaldson, editor of Moonbroth. Issue three contained an interview with Lin Carter (Spaceteer), and the article "Paul Berglund Speaks", as well as a forum on reprinting by Edward Paul Berglund (fiction editor of Nyctalops), Dale Donaldson, Gerard E. Giannattasio, Jessica Amanda Salmonson, and Darrell Schweitzer. Art work was by Jude Fulkerson. Issue 4 featured an interview with Issac Asimov, book reviews by John Taylor, and a forum on posthumous collaborations by Paul Berglund, Eddy C. Bertin (Dunwich Dreams), Dale Donaldson, and Darrell Schweitzer. Art work was by Jude Fulkerson, Jackson Gardner, and Jim Garrison. Fred Adams later published two volumes of the Spoor Anthology, the second one guest edited by Edward Paul Berglund. Contributors to the anthology included Arthur Aspromatis, David J. Brown, Llewellyn M. Cabos, Gerard E. Giannattasio, William Scott Home, Richard Landwehr, David E. Schultz, and Robert E. Weinberg, with artwork by Jude Fulkerson and Harry Morris (Nyctalops). Fred Adams is also known as a writer of Cthulhu Mythos stories, which were published in a number of fanzines, including Space and Time. This page was last modified on 13 February 2012, at 14:56.